How can you learn more about what you may not even realize exists? Did you ever wish that you had a technology-savvy friend who could help you figure out what you needed to know right now? Perhaps he or she could point you in the right direction or share what may help you overcome a barrier and get you to that next step? I enjoy speaking to groups and interacting with families and colleagues not only to help them reduce stress, speed up progress or make life more comfortable but also because I benefit from the experiences and tips that they share with me. It’s exhilarating to collaborate with others who share my passion for figuring out how to take advantage of the exciting and rapidly advancing world of affordable technologies. 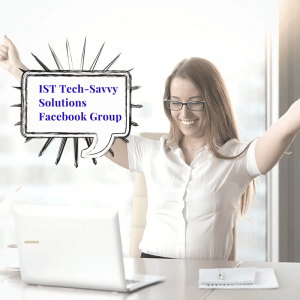 I hope you will join me in the IST Tech Savvy Solutions Facebook Group. After answering just a few quick questions, you will be able to access this free private group. Some of us are energized by exploring potential tech solutions, others find it overwhelming and frustrating. Let’s help each other out! 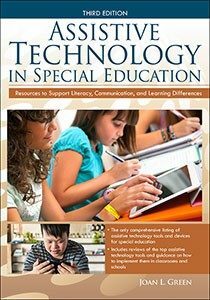 This IST Tech Savvy Solutions Facebook Group is the right place for you if you are trying to figure out how to use mobile technologies such as Smartphones, tablets, computers and other mobile devices, apps and accessibility features to help a child or who has challenges related to communication, cognition, literacy or learning. We all have different experiences, perspectives, successes, and failures. Let’s connect so that together we can explore resources that we may not even be aware exist.